Details of the deal were passed by an anonymous H&K whistleblower to Jürgen Grässlin, Germany’s most prominent anti-arms-trade campaigner. Grässlin informed German state prosecutors of the illegal deal back in April 2010 but they did nothing until the deal was exposed in the German media in December. German MPs demanded action, so on December 21st, 20 police raided H&K’s headquarters searching for evidence of the deals. H&K is claiming that it only sold the weapons to central government, not to particular states. This disingenuous claim is undermined by evidence that H&K employees flew out to the banned states and trained the police in how to use the weapons. Heckler & Koch has a long history of evading arms export restrictions and campaigners against the company believe that it has conducted many other illegal arms deals. However, this is the first time that a whistleblower from inside the company has provided hard evidence. H&K has an international sales office and warehouse stocked with automatic weapons in Lenton, Nottingham. Campaigners continue to call for it to be shut down. 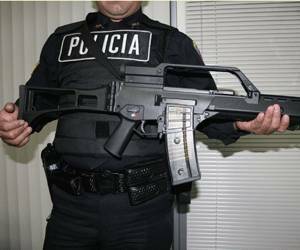 UPDATE: The German government has banned H&K from sending any more weapons to Mexico while investigations are carried out.